Before we entered the cave itself, we had the opportunity to see a display of objects that have been used for centuries by indigenous people of Cuba. Members of our group were particularly taken with the conches, which made a keening sound when you blew into them. 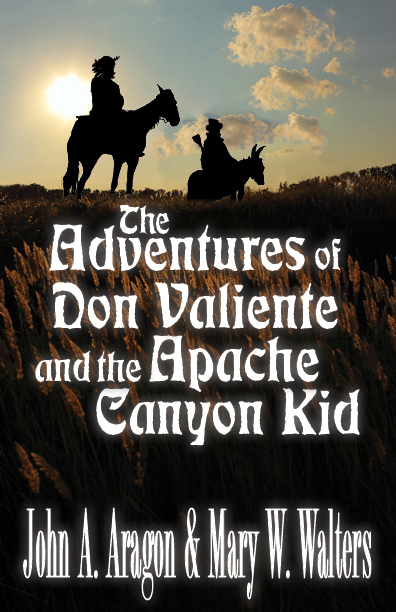 We then entered the cave and walked along a narrow passage to a waterway. There, a motorboat took groups of ten or twelve from a small dock through the cave and out to a landing on the other side. It was a short trip but memorable. There were (of course) bats but (of course) I couldn’t get a photo of them. 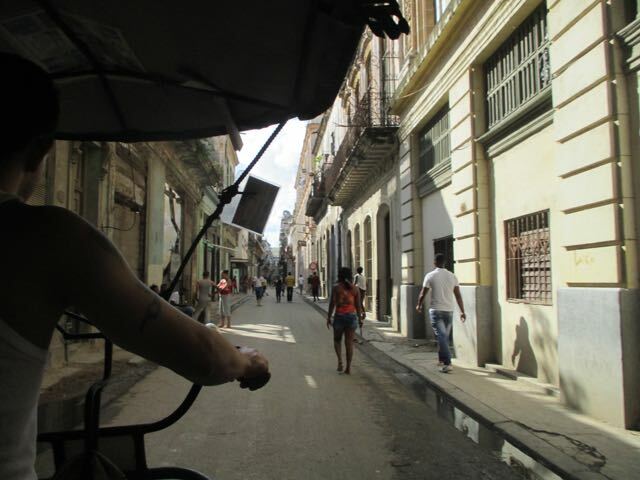 We arrived in Havana in the early afternoon and had time to check into our casa particulares (the same one we had stayed at the previous Sunday night) before heading out in a bicycle cab to join the group for a walking tour of the city. 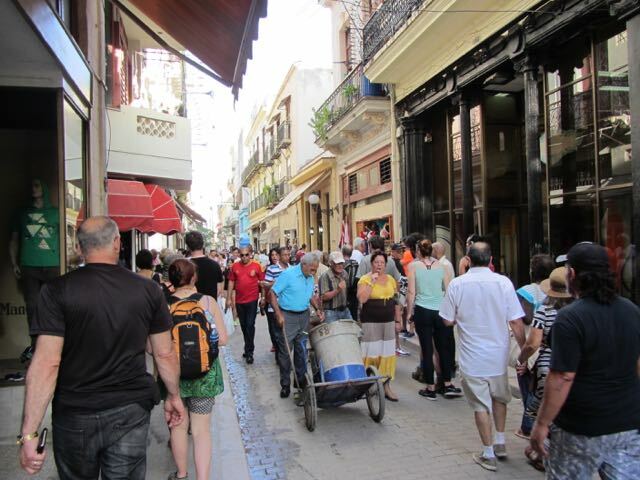 We had wandered around old Havana on our own the previous Sunday, but we learned a good deal more when we had someone to explain what we were looking at. To list everything we saw on the two-hour walk, which included Havana’s five major plazas among other attractions, would make this a very very long entry, and it is already going to be quite long. So instead, below and in the next post I’ll give you what I thought were the most interesting highlights. We met our guide Manny and most of the rest of the group at the Hotel Inglaterra, near the National Capitol Building which marks the centre of Havana. Completed in 1926, El Capitolio was built with the US capitol building in mind, however, as Manny explained with pride, the one in Havana is six metres taller than the one in the US. 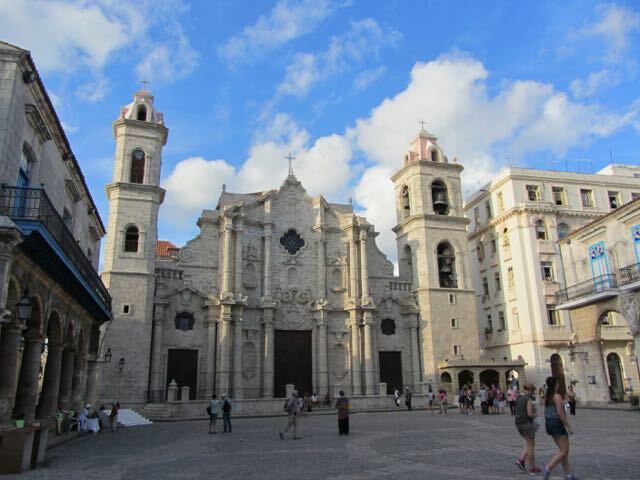 El Capitolio housed government activities until the Cuban revolution in 1959. Like many many notable buildings in Havana, it is now being reconstructed, and when it is finished it will again become the seat of the National Assembly. 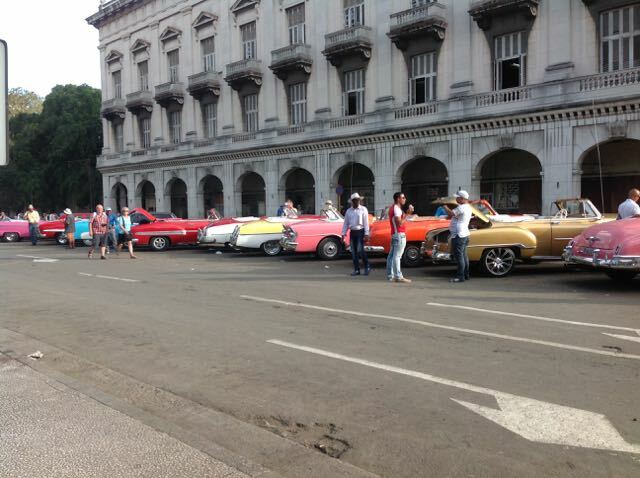 We then walked past the Saratoga – the most expensive hotel in Cuba – and the Gran Teatro de La Habana and into Central Park (“where they argue loudly about baseball”). 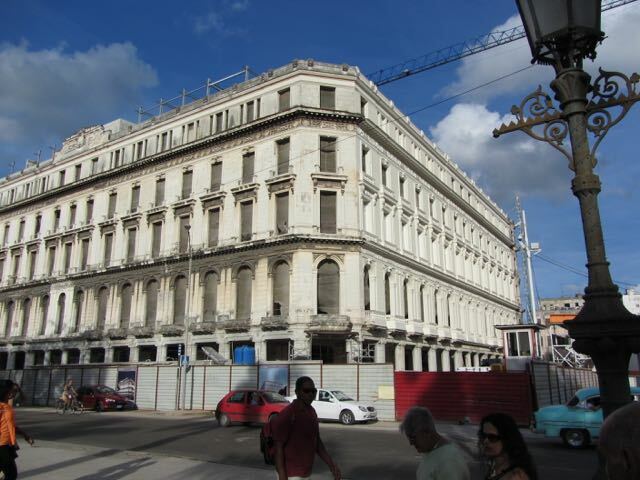 Nearby, a hotel (the Manzana), currently under reconstruction, features bullet holes incurred during the Revolution. We set off down Havana’s famous Obispo Street (where no smoking is allowed), walking past one of Hemingway’s favourite haunts — the Floridita bar – where a few years ago, in honour of what would have been the author’s 113th birthday, the owners blended 27 bottles of rum with proportional amounts of the other requisite ingredients to make the biggest daiquiri in the world. Havana used to be the most attacked city in the world, with pirates from everywhere descending on the harbour with greed in their eyes. Around 1600 the Spanish decided to fortify, and the remains of the resulting battlements can be seen at Parque Histórico Morro y Cabaña. During the Colonial era, every night at nine a cannon was fired from the fortification to announce the city’s curfew, and the traditional continues at the Cabaña Fortress today – although (one can assume from accounts of the nightlife in Havana) now it is ceremonial only. 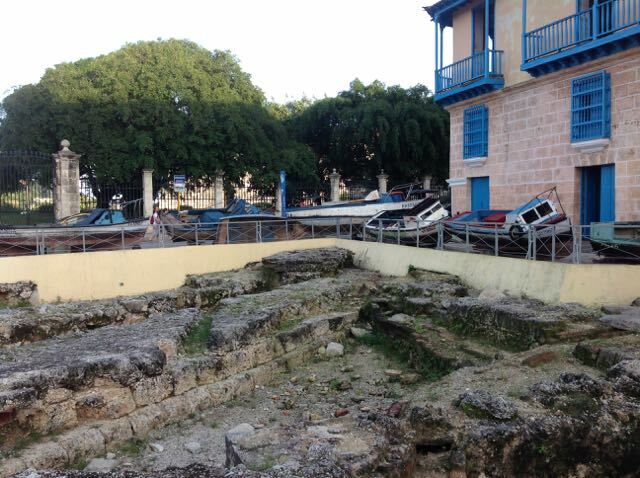 Near to the remains of the fort, there is also a display of boats that have been retrieved from the bottom of the Caribbean Sea, a warning to others who – like the boats’ original owners – might be tempted to flee the island. 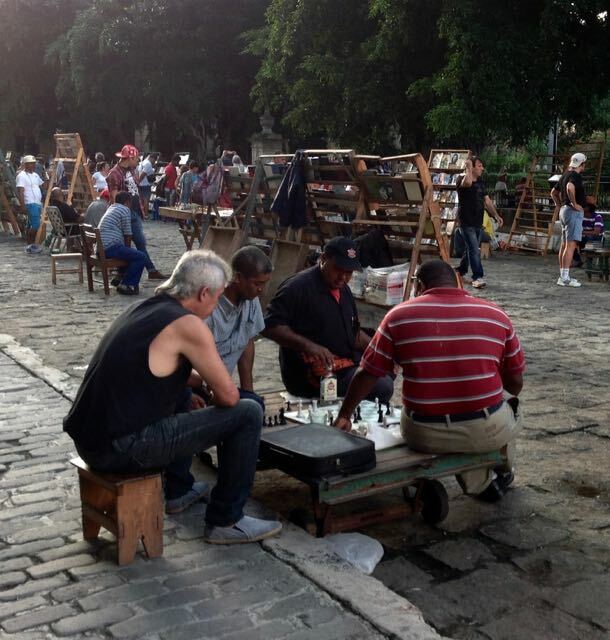 We moved on to the Plaza del Armas, which is well known for its hundreds of local vendors of old books, antiques, and artworks (and the typical scenes of men playing chess). 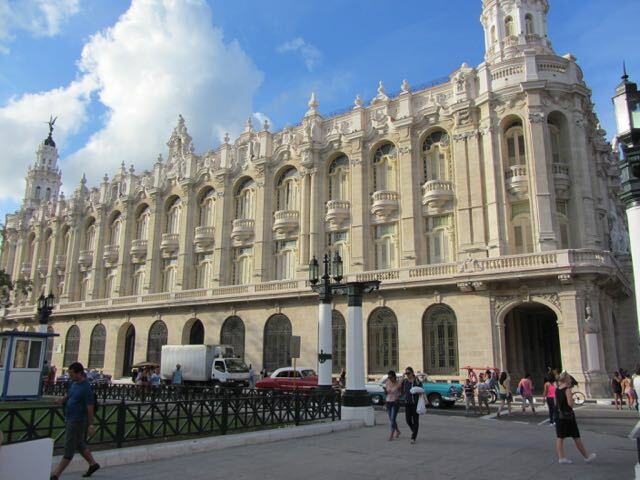 On the eastern side of the plaza is the Palacio de los Capitanes Generales, the former residence of the governors (capitans) of Havana, and current home of the Museum of the City (Museo de la Ciudad). 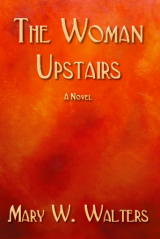 A part of the street itself is made of wood, rather than stone; it was re-surfaced in response to complaints from visitors at nearby hotels about the sounds of horses’ shoes clip-clopping on the cobbles.